However, Guinness also recognized another woman as the first female president of a republic. This woman was Gen. Juan Perón' s widow, María Estela Martínez de Perón. Isabelita, as she was commonly known, became president on July 1, 1974 when her husband died. She stayed in office only for 2 years. A military coup deposed her from her presidency on March 24, 1976. Sri Lanka, formerly Ceylon, gave the world its First Woman Prime Minister (at least in the modern times) She was Sirimavo Ratwatte Dias Bandaranaike. Prime Minister Bandaranaike also holds the record for Longest Tenure for a Woman Prime Minister. This was from 1960 to 2000. In 1918, Madame Constance Georgine Markievicz was the first woman to gain a seat in the British House of Commons. However, she never took her seat apparently due to her Irish Republican views. Viscountess Astor, who won in 1919 as Member of Parliament (MP) for Plymouth Sutton, was the first woman to officially sit as an MP. Lt. Gen. Ann E. Dunwoody is the U.S. Military's first female four-star general. She was 55 (in 2008) when she received her unprecedented promotion. General Dunwoody is Commander of the Army Material Command. She overseas the task of sending equipment and supplies to U.S. military commands worldwide. Today, people know Graca Machel as the third wife of former South African President Nelson Mandela. She married Mandela in July 18, 1998. But Machel was once the spouse of the Samora Machel, who was President of Mozambique from 1975 up to 1986. But beyond being famous because of her association to presidents of two different countries, Machel is a humanitarian who advocates for women and children's rights. She speaks Tsonga, English, French, Spanish, Portuguese, and Italian. Everyone who passed elementary knows Marie Curie. She was the first woman awarded a Nobel Prize in Physics. French born Curie was working with Pierre Curie, her husband, on Professor Henri Becquerel's radiation phenomena. The Nobel Prize in Physics, which was awarded to all 3 of them in 1903, was divided into two. One half for Becquerel and the other was jointly awarded to the husband and wife team. Selma Lagerlöf of Sweden was bestowed the Nobel Prize for literature back in 1909. She was a teacher with a passion for writing. One of her best works was Gösta Berlings Saga. Lagerlöf was born in 1858 and died on 1940. Maria Gorokhovskaya, a native of Ukraine, was an accomplished gymnast. During the Helsinki Olympics in Finland back in 1952, she bagged 2 gold medals and 5 bronze medals. Larisa Semyonovna Latynina, who represented the USSR, won the most Olympic medals. This was from 1956 and 1964. Latynina's medal count was 18. That's 9 golds, 5 silvers and 4 bronze medals. Latynina also has the Guinness record for winning the most Olympic gold medals for an individual event. She won a total of 9 gold medals, 4 in 1956, 3 in 1960 and 2 in 1964 all for gymnastics. The world-renowned Harlem Globetrotters, a group of highly skilled basketball entertainers has always been an all male group, at least until 1985. On January 1, 1985, Lynette Woodard, the 1984 team captain of the U.S. Olympic Basketball Women's Team, joined the Harlem Globetrotters to entertain the world through basketball. High-speed car racing is not just for men. Danica Patrick became the very first woman to lead the Indianapolis 500, not once, not twice, but thrice. This was in May of 2005. She wasn't the first woman on the tracks but among her female counterparts, she had the highest start and finish in the event's history. Everyone is in awe of Jessica Cox. This Filipino American was born on February 2, 1983, without arms. Yet, on October 10, 2008, she received her pilot's license to fly a plane. Her license allows her to fly light-sport aircrafts up to 10,000 feet. She controls a plane with both her feet. Because of this extraordinary feat (no pun intended), Jessica is a good role model and the perfect motivational speaker not only for young girls but also for anyone who has challenges that they need to overcome. Men have flown faster than Mach 1 (the sound barrier) many times over before American Jacqueline Cochran broke the sound barrier herself. This female aviator flew a jet-powered aircraft past Mach 1 on May 18, 1953. Born in 1906, Cochran set speed records during her time as a female aviator. In 1967, when Cochran was 60 years old, she achieved 8 speed records proving that age was just a number. Who doesn't know the name Amelia Earhart? This Kansas native was a true trailblazer for womankind. From May 20 -21, 1932, Earhart made her first transatlantic flight on a single-engine Lockheed Vega. It took her 13 hours and 30 minutes to complete her solo flight across the vast Atlantic Ocean starting from Newfoundland, Canada to Northern Ireland. Earhart made 2 attempts to circumnavigate the globe without success. She was lost at sea sometime during her second attempt on July 2, 1937. To this day, no one knows what happened to Earhart and her navigator. Australian Kay Cottee left Sydney, Australia on the yacht christened First Lady on November 29, 1987. On June 5, 1988, after 189 days, she returned to become the first woman to sail around the globe alone and non-stop. Sabiha Gökçen was born in Turkey. She was the adopted daughter of former Turkish President Mustafa Kamal Atatürk. Gökçen was schooled in the Eskisehir's Military Aviation Academy where she became an aviator and subsequently the world's first woman combat pilot. All in all, she flew 32 combat missions out of her 8,000 flight hours. Rowing across the Atlantic Ocean and the Pacific Ocean is no simple task. But, Roz Savage accomplished it on June 3, 2010. Savage, a British national, took 103 days, 5 hours and 43 minutes to cross the Atlantic. Her row across the Pacific took about 249 days. USSR's Valentina Vladimirovna Tereshkova was the first female cosmonaut to orbit planet Earth. Her journey in space began on June 16, 1963 aboard Vostok 6. The spacecraft, which made 48 orbits, landed on June 19. The first woman to perform a spacewalk was Svetlana Savitskaya, also from the USSR. Savitskaya had the additional distinction of being the second female cosmonaut in space. This was on July 25, 1984. She was part of the Soyuz T12/Salyut 7 mission. One-time wife of mega-director James Cameron, Kathryn Bigelow, became the first woman to ever receive an Academy Award for Best Director. This was on March 7, 2010, for her movie Hurt Locker. Ironically, Cameron was also nominated in the same category that year for his blockbuster movie Avatar. Sarah Louise Delaney penned the book entitled "The Delany Sister's Book of Everyday Wisdom" together with her sister Elizabeth. Louise was 105 when the book was published in 1994 while Elizabeth was 103. The Harry Potter Series (7 books in all) was J.K. Rowling's ticket to the billion-dollar club. A citizen of the United Kingdom, Rowling made money not only from the sales of her novels but also from the Harry Potter movies and other business ventures related to her best selling books. Harry Potter books have been translated into 55 languages. 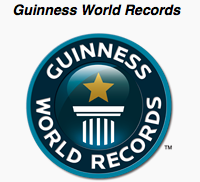 One last record that may be interesting to mention but has nothing to do with a female Guinness record holder is the record for the Most Male Dominated Society. According to Guinness, the autonomous republic of Mount Athos, which is a peninsula in Greece, is not accessible to females. There are 20 Eastern Orthodox monasteries on Mount Athos and a number of dependencies. It is said that the reason for the ban on females is to make living a celibate life easier for the monks. But what is interesting is that, according to the Guinness website, female domestic animals are part of this ban! She is not your typical bodybuilder. Ernestine Shepherd, who was born in the U.S. on June 16, 1936, has the distinction of being the oldest competitive female bodybuilder. At 74, she can put any young woman (and man) to shame with her six-pack, her strength, stamina and zest for life. Proving that no one is too old to climb, Japanese Tamae Watanabe reached the top of the highest mountain in the world on May 16, 2002 at exactly 9:55 in the morning. She was 63 years and 177 days old at that time. Climbing the seven summits of the world is any serious mountain climber's dream. The seven summits are: Mount Everest (Asia), Denali AKA Mount McKinley (North America), Aconcagua (South America), Kilimanjaro (Africa), Mount Vinson (Antarctica), Mount Elbrus (Europe), and Mount Kosciuszko (Australia) or Carstensz Pyramid (Australasia/Oceania). Jeanne Stawiecki of the United States climbed all of them. Her last was Mt. Everest in Nepal. This was on May 22, 2007. Stawiecki was 57 years old and 36 days when she reached the famous summit. On top of this, Stawiecki has completed marathons in all continents. When Nepalese Lakpa Sherpa reached the summit of Mt. Everest on June 2, 2005, she became the woman to beat in the category Most Ascents of Mt Everest (Female). Her American husband, George Demarescu, was with her when she established the record. Demarescu was on his 7th climb of Mt Everest at that time. During her 2003 climb, Sherpa was with her sister Ming Kipa Sherpa, who because the youngest person to conquer the tallest mountain of the world. In the Guinness World Records you will find more women who have done extraordinary things as well as women who broke records for simply being who they are. There are many other records that women hold that are not even part of the Guinness list. During this Women's History Month, remember the great women in recent history and in the past who have made contributions, both big and small, to the world that you now live in. Women break records everyday. Although not all of these records make it to the Guinness World Records, they are still special and important to the women and the people who love and support them. Jeanne Louise Calment has seen it all. Or at least she saw more than most people will ever see in their lifetime. Guinness has her in two records, Oldest Person (Female) and Oldest Actress. Calment was born in France on February 21, 1875 and died on August 4, 1977. She lived for 122 years and 164 days. Calment saw two world wars, the development of modern cars, airplanes, television and other items and the fast-paced changing of the world around her. World events (social, political, economic, etc.) passed her by and she was quoted as saying that her life was too short. She once said that she met the great artist, Vincent Van Gogh. She acted in a film playing herself when she was 114 years of age. The film was Vincent and Me. Her lifestyle was far from sedentary. At 85, she took up fencing. At 100, she could still ride a bike. Calment enjoyed life to the fullest and it showed. One time French President Jacques Chirac referred to Calment as the grandmother to the French people. American Besse Cooper is one for the books. She is the oldest living person today at 115 years and 200 days (and counting). She hails from Tennessee but now lives in Georgia. Cooper's husband Luther died in 1963. She has 4 children and a host of grandchildren and great grandchildren. When Jyoti Amge from India was measured last December 2011, she was only 24.7 inches or 62.8 centimeters high. Jyoti's measurements were done the same day she turned 18. Bridgette Jordan, a native of Illinois, U.S.A, held this record previously. Pauline Musters of The Netherlands was born on February 26, 1876. Nicknamed Princess Pauline, she died at the tender age of 19 in New York City. Her measurement at the time of her death, which was on Mar 1 1895, was 24 inches or 63 centimeters. On January 1, 2010, representatives of the Guinness Book of World Records found the tallest woman alive in China. Her name is Yao Defen. Defen stands at 7 feet and 7 inches or 233.3 centimeters. The Tallest Woman ever was also from China. Her name was Zeng Jinlian from the province of Hunan. She was measured at 8 feet and 1.75 inches or 2.48 meters at the time of her death on February 13, 1982. American Stacey Herald is the shortest woman to give birth. She measures 28.5 inches or 72.39 centimeters. Her first child was born on October 21, 2006 followed by another child on January 1, 2008. Another child followed in November of 2009. Yes, to her grandchildren. Jacilyn Dalenberg of the U.S.A. was the surrogate for Kim Coseno, Dalenberg's daughter. Dalenberg delivered her daughter's three baby girls on October 11, 2008 in Cleveland, Ohio. Nadya Suleman owns the record for most children delivered at a single birth where all infants survived. On January 26, 2009, Suleman gave birth to 6 boys and 2 girls in California. Conceived via In Vitro Fertilization (IVF), the 8 children were delivered via Caesarian section. The media christened Suleman as Octomom. Apart from the octuplets, Nadya has 6 more children. That's a total of 14 children in all for the Octomom. Vivian Wheeler's beard made headlines when her beard was measured on April 8, 2011. This American woman's beard was 10.04 inches or 25.5 centimeters long starting from the follicle all the way up to the tip of the beard. Each girl is particularly specific, however, there are ladies who managed to set world information, do something outstanding, or even surprise human beings. Check out a number of the best and quirkiest lady international facts and videos. Galvanize your friends by breaking or inventing your personal female global | Source by Buy Essay Online - 6 Dollar Essay. Lina Marcela medina de Jurado (Spanish pronunciation: [ˈlina meˈðina]; born 23 September 1933) is a Peruvian female who has become the youngest showed mom in clinical history, giving delivery - Shared by Custom Assignments | Custom Assignment Services. I'm attempting to take pictures while I jar of my blooms. The dry spell is what is causing the grasshopper blast this year. Someone Write my Paper They have inclinations on what they jump at the chance to eat yet once that is gone they'll eat the rest. The youngest man or woman to give beginning become only 5 years vintage. Today I found out that the youngest character to ever come to be pregnant and provide beginning turned into most effective five years vintage! Lina Medina turned into born on September 27th, 1933 in ticrapo, peru | Homework Help Chat Online. In this era women's make a great and very vast contribution in every field of life also they can do anything just like a Man and those women's who are in the list we Assignmentace writing help cheap are really appreciated their work because without them we can't imagine how tough our life could be. Ever single women are working really hard to achieve the goal which they set in life although it looks like a difficult task for them but in the end they manage to acheive it after many hurdles and our top cheap essay writing service review always admire their efforts and the way they work it is appreciable and we should admire their efforts as well, Their contribution is really important for us.